We are living in a paradoxical moment, while all reliable data suggests that immigrants are integrating as fast, or faster than in previous generations, anti-immigrant rhetoric and violence appear to be on the rise. Maybe that is to be expected. During periods of mass migration, newcomers have often been met with skepticism and distrust. Beyond the predictability of prejudice, an informed observer will recognize that many of the stereotypes directed at immigrants today echo those that were used to label immigrants in the past. We believe that one way to empower young people is to help them gain a perspective on current events by developing their historical understanding. They can learn from the past that there are patterns of prejudice that we can identify and the ability to make well-reasoned historical connections —recognizing what is familiar from a study of the past, and what is new and unique to our present moment — is an important skill for both young people and adults. 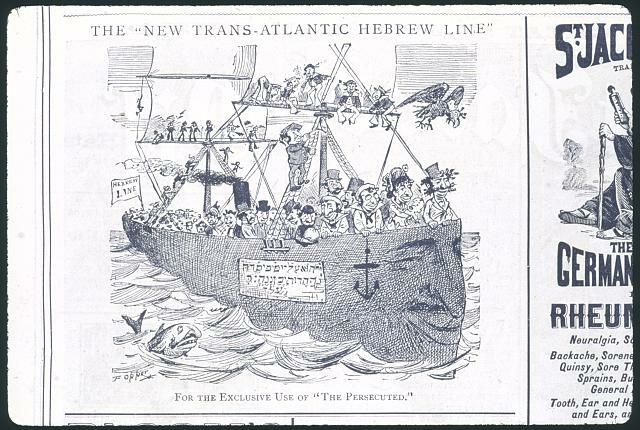 There are many ways to introduce histories of anti-immigrant prejudices. As an educator, I prefer to use primary sources and direct quotations as much as possible. Encountering prejudice, even in language stings, and it may sting for some of your students more than others because of who they are, what they have experienced, and what they have or not been exposed to. There is always a danger of introducing stereotypes while you are attempting to identify and eradicate them. For that reason, there are educators I respect who choose not to introduce primary sources from perpetrators of prejudice into the classroom. Obviously, I am suggesting a different approach: deconstructing them. How have you contracted for the discussion? Are there words that are off limits? If so, students should know that ahead of time as well as the reasons behind those decisions. 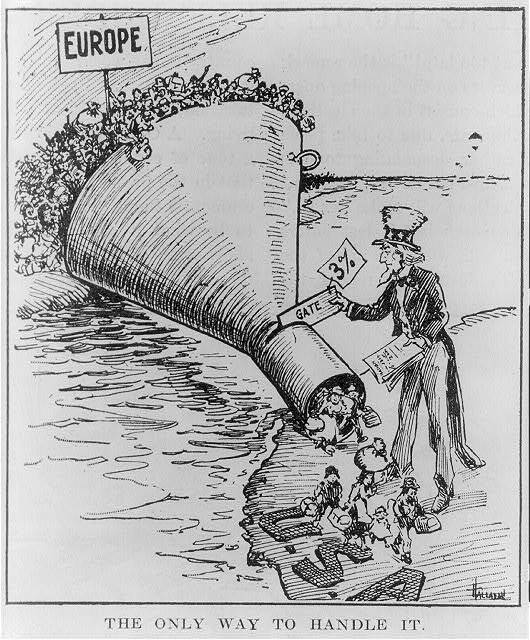 For this lesson, I selected a number of anti-immigrant cartoons. You should choose your images carefully. Don’t just choose the best images: remember your teaching goals, know your students, and make sure the images you selected are representative of period and attitudes you hope to introduce, and finally, make sure you know about the sources of your image. It is very difficult to identify the intent of a political cartoonist if you don’t know the period in which they worked or the audiences they hoped to influence. I might begin by asking students to think about the relationship between images and ideas they encounter in media (social media, entertainment, news, etc) and the way they think and act. While many people believe they are immune to the influence of media on their actions, almost all of us can think of times when we felt that a group we are part of was unfairly depicted in media. Moreover, researchers have found again and again a relationship between consumption of stereotypes from various media and the way people behave in the real world. For much of the history of the United States print, newspapers and magazines, in particular, was the dominant form of media. In the late 19th and turn of the 20th century, big cities in the United States often had several competing newspapers with different editorial points of view. There were also popular magazines with national distribution, such as Harper’s Weekly. Those media outlets help to frame the way people thought about the world in which they were living. 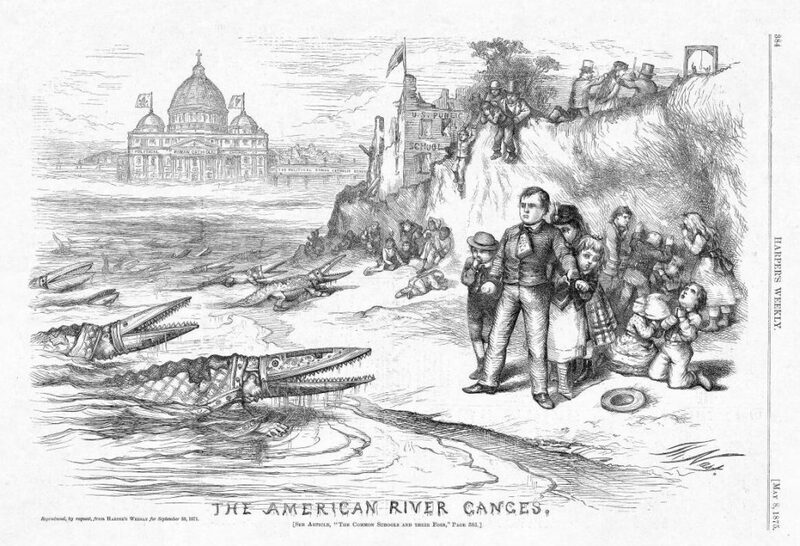 One great source for thinking about these issues is a robust blog about the work of the illustrator Thomas Nast. From the arrival of the First Nations of native peoples, to European explorers seeking treasure and religious freedom, to the mass involuntary migrations of enslaved Africans, to the trans-oceanic migrations of yesterday and the ongoing global migrations of today, migration defines the American experience. Many scholars explain that there have been waves of migration that have ebbed and flowed over time. Those ebbs and flows have been a result of push factors that have led migrants to leave their homes (including violence, poverty, and force), pull factors that have made the United States a destination, legal restrictions on immigration, and anti-immigrant attitudes. 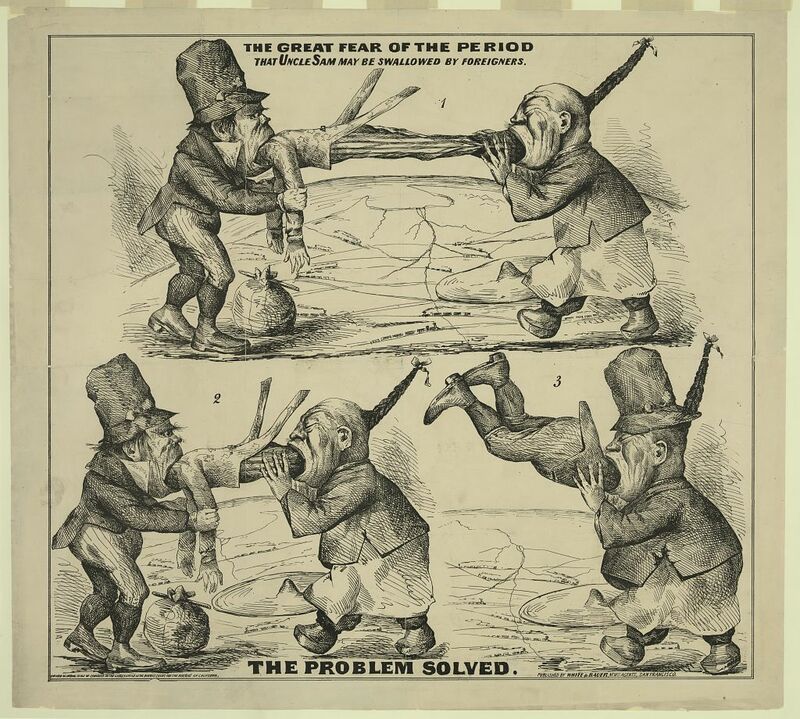 The political cartoons in this lesson are from the mid to late 19th and early 20th century. This period is recognized as both a time of mass migration to the U.S. Migrants to the country found both new opportunities as well as nativism and anti-immigrant prejudice. 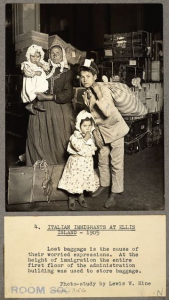 You might contextualize this lesson by introducing a timeline or an overview of the history of migration to the United States. Below I’ve identified a few sources that you might find helpful as you think about the historical context. 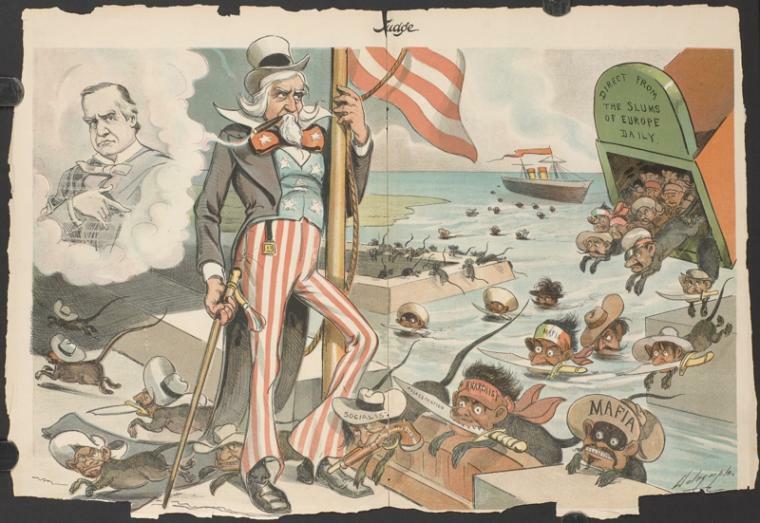 In this lesson, we will ask students to analyze political cartoons to identify patterns of anti-immigrant stereotypes. It is important to convey to students that political cartoons are intended to have an editorial point of view. Therefore the cartoonist is shaping their message in order to influence the way their reader thinks and acts in relation to an issue. 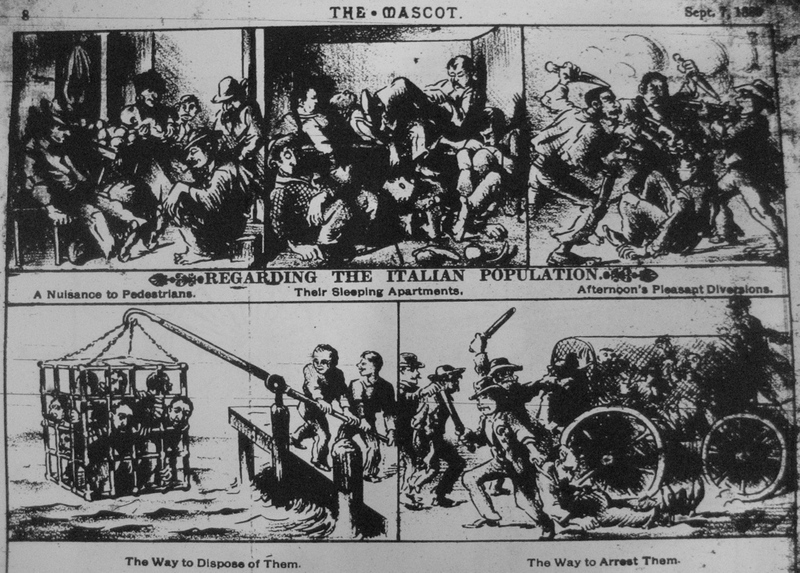 In almost every one of the cartoons, negative stereotypes are embedded in the editorial message. 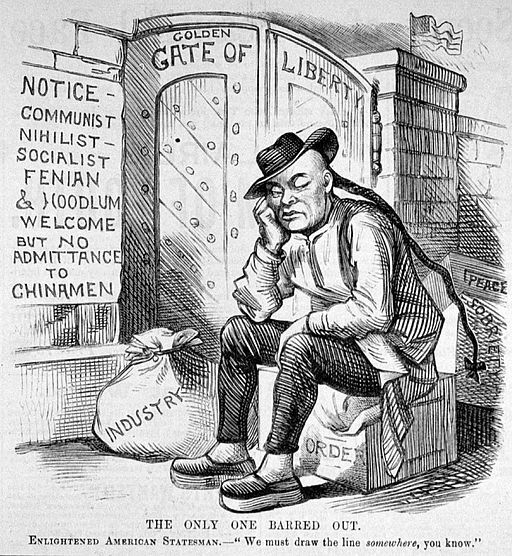 Below we have curated a selection of anti-immigration cartoons for use in this lesson. Click on an image to scroll through the images or use the pagination on the lower left of the gallery. There are many different strategies you can use to interpret images. I prefer a very simple three-step process. Describe the image: Encourage students to describe what they see in as objective terms as possible. In other words, avoid analyzing or interpreting the image until you have captured the all of the detail in an image. Analyze the elements: Now focus on the various elements of the picture. Consider why they artist might have included them? For example, why did they choose a particular color, angle, or symbol? I like to begin this process as a group so students can begin to hear multiple perspectives on something about which they might be certain. It is in this step that students should begin to identify negative messages and stereotypes about immigrants. Encourage students to make those explicit. Interpretation: This is the step where students are asked to synthesize their observations and their analysis. Have students reflect on how the stereotypes they have identified contribute to the editorial messages in the cartoon. I like to have students write their thoughts on their own before sharing them with a partner. In those pairs or in groups, prompt students to listen for ideas from their peers that are both similar and different than their own interpretations. Give them a few moments to revise their interpretations after discussing their ideas with others. To conclude the lesson, ask students to share their observations about the set of images they have viewed. What patterns do they notice across the images? What differences do they notice? 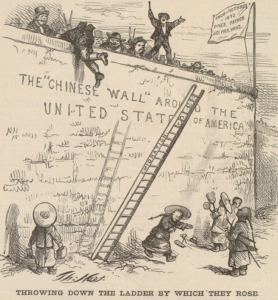 The Chinese Exclusion Act and Chinese Immigration to the US. To debrief the exercise, ask students to note what they found Surprising, Interesting, and Troubling. 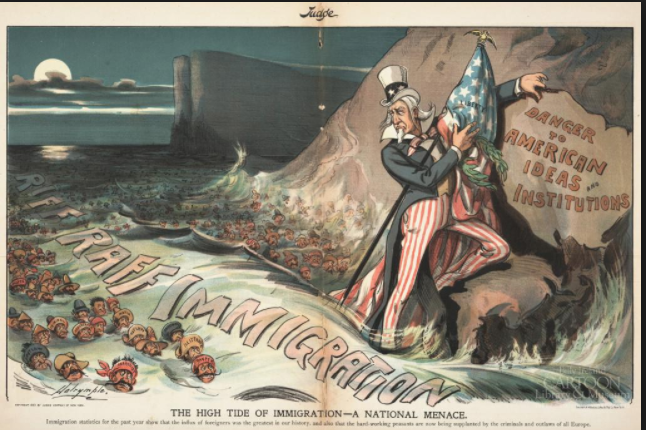 I would encourage you to think about how to connect their observations about anti-immigrant prejudice as depicted historically to anti-immigrant prejudices today. What is familiar? What differences do they notice? You might think about including some of the observations Marcelo Suarez-Orozco and Carola Suarez-Orozco made about contemporary anti-immigrant stereotypes from this blog. Finally, consider what it would take to counter the stereotypes that were conveyed in the images that were used in the lesson or those that we hear today. 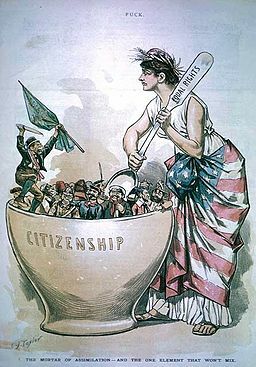 What is the role that immigrants and non-immigrants might play in breaking down anti-immigrant bigotry? To extend the lesson you might ask students to find examples of anti-immigrant and ethnic stereotypes they see in different media today. Let us know how you use this lesson and what you believe your students knew and understood differently afterward.